Sometimes we just need comfort food. Sweet or savory, some foods actually make our endorphins flow. While food should not be used to cope with life, which can lead to obesity, food should be enjoyable and a positive experience. 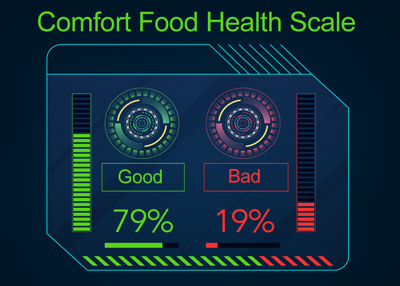 Comfort foods should come with a health scale on the label. So one of my comfort foods can be made vegan or vegetarian, more or less healthy. French Toast. Just breakfast? Maybe for you, but for me, every bite melts away stress so long as I take the time to enjoy it and not scarf it down. Whisk eggs and milk. Dip bread into egg mixture and fry in a medium hot non-stick pan for a couple minute each side. 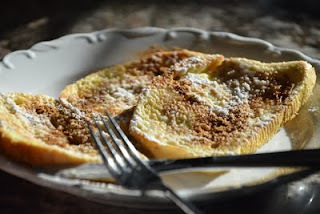 Top with margarine, icing sugar, and cinnamon. Ok, honestly my cookbook recipes are much better than this, but with comfort food part of the joy for me is NOT using a recipe! LOL. Here is an actual recipe from my cookbook (you can get my cookbooks FREE here). Blend all until very smooth; pour into large flat bowl. Dip bread quickly into mixture and fry on med low heat on non-stick pan or griddle. Flip when golden brown. Top with sliced fresh fruit! brands of store bought bread need to be dried out just a bit before using to prevent them from going soggy. What are your favourite comfort foods? Do they need help to dial up to the healthier side of the scale? Let us know!